The events surrounding the coming of Our Lord, God made Man, are cause for intense joy. 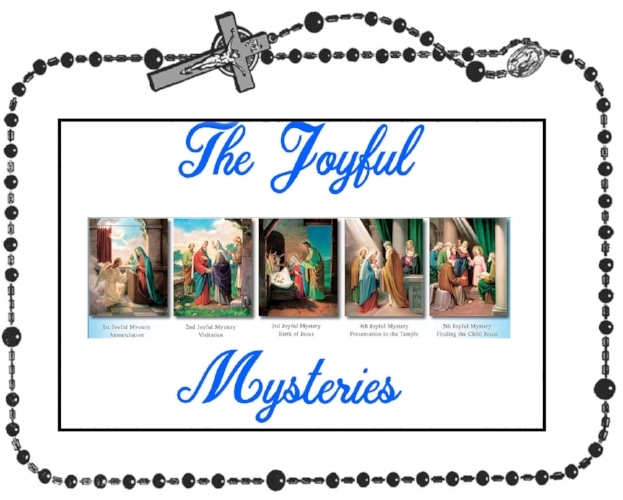 We meditate on these mysteries asking Our Lady to help us discover the secret of Christian joy - the coming of Our Lord Jesus Christ in the flesh. The angel Gabriel was sent from God to a city of Galilee named Nazareth, to a virgin betrothed to a man whose name was Joseph...and he came to Her and said, "Hail, favored one! The Lord is with you!" Mary set out and traveled to the house of Zechariah and greeted Elizabeth. When Elizabeth heard Mary's greeting, the infant leaped in Her womb, and Elizabeth, filled with the Holy Spirit, cried out in a loud voice and said, "Most blessed are you among women, and blessed is the fruit of your womb." And Mary gave birth to Her first born Son. She wrapped Him in swaddling clothes and laid Him in a manger...and suddenly there was a multitude of the Heavenly Host praising God and saying, "Glory to God in the highest and on earth peace to those on whom His favor rests." Mary and Joseph took the baby Jesus to the temple to present Him to the Lord. At the temple, Simeon and Anna came forward, gave thanks to God and spoke about Jesus to all who were present. After three days they found Him in the temple, sitting among the teachers, listening to them and asking them questions and all who heard Him were amazed.